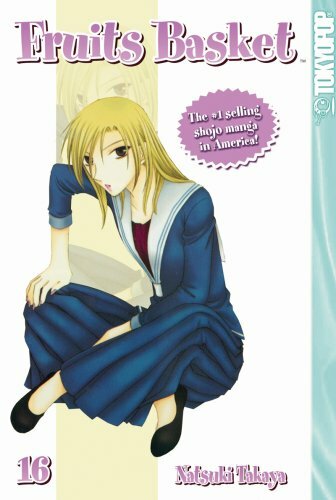 The character story for Volume 16 is Kyoko, Tohru's mother. We already know a little bit about her from an earlier volume. She was pretty wild as a teenager - in a gang where she beat up people and got beat up. Her parents hated her and she hated herself. All this changed when she met Katsuya Honda, a student teacher at her school. He restrained himself from getting involved with her while he was working at the school, but there was obviously an attraction. He was the only reason she went to school at all. As soon as Kyoko graduated, they got married. They were so happy. Pretty soon little Tohru arrived. Everything was wonderful until Katsuya died suddenly of an illness. Kyoko was devastated. If it wasn't for Tohru she never would have survived. The summary plays up the idea that Kyo met Kyoko when he was young, but I didn't get that part. I think I saw where it was in the book, but it seemed insignificant to me. I thought it was unnecessary to involve Kyo. Kyoko's story stands on its own. Next up is another student council interlude featuring Machi. She has a crush on Yuki and he seems to like her too. She's not as flighty as the other girls in love with Yuki. For the most part thought, I think the student council plot arcs are pointless and introduce too many new characters. I get confused over who is who. The book ends with Yuki's new year's visit to Akito. Yuki insults Akito. I wasn't exactly sure how. He tells Akito that he forgives him...or maybe he doesn't forgive him. Then Akito ponders Yuki's eyes and loses it. He goes completely nuts and attacks Yuki. Poor Yuki. The guy can't get a break. I wish Takaya had explained the reason for Akito's anger better. It was confusing. Another interesting volume although I felt that some connections were missing. Maybe things will make more sense when I'm finished with the series. Catching up with some blogs I haven't visited in a while. A great review, I think it is wonderful that you are so passionate about this genre. Another great review and thanks for spotlighting this awesome series!